All through October, Alphabet Soup is celebrating turning three. 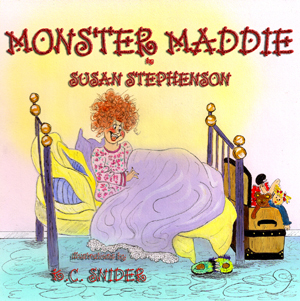 We have heaps of writers and illustrators stopping by to answer THREE QUICK QUESTIONS and today’s visitor is Susan Stephenson, also known as The Book Chook, and author of Monster Maddie. 1. Where do you like to write? We have a tree in our garden called the Thinking Tree. There’s a seat at its base where I love to sit, because it’s so peaceful there. I scribble and think, think and scribble, and listen to what my characters have to say. 2. Can you name a book you’d recommend to our readers? 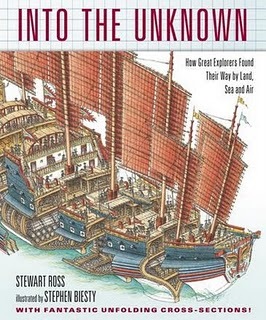 One of my favourite books is Into the Unknown: How Great Explorers Found Their Way by Land Sea and Air. It was written by Stewart Ross, illustrated by Stephen Biesty, and published by Walker Books. I loved its stories about real-life explorers, and also all the maps and foldouts and the fantastic detailed drawings. Find out more about it in my review at The Book Chook. 3. Can you offer a word or phrase that kids could use for inspiration if they have writer’s block? I think the very best phrase to use when stuck is “what if … ?” What if my hero falls flat on his face in front of the dragon? What if a raven swallowed the ring? What if the bully has a phobia about grasshoppers? That question has taken my stories in many surprising directions! Susan Stephenson is a writer who lives about as far east as you can go on Australia without falling off. She loves reading, writing and pretending to be a chicken. Susan writes a blog about children’s literature, learning and literacy at The Book Chook.